State Councilor and Foreign Minister Wang Yi said China will continue to follow a peaceful development path, uphold the existing international system and favor cooperation over confrontation. 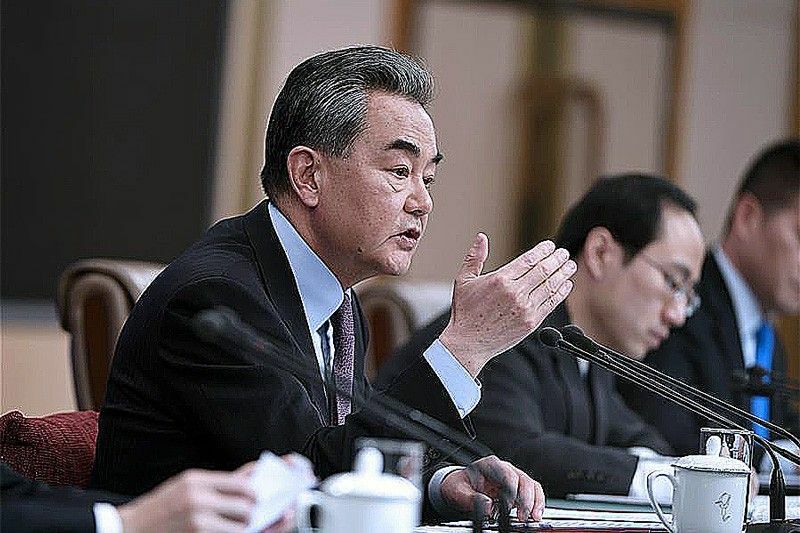 BEIJING (Xinhua) — China on March 8 elaborated its foreign policy championing peace, development, cooperation and multilateralism, providing certainty to a world full of uncertainties. At a press conference, State Councilor and Foreign Minister Wang Yi said China will continue to follow a peaceful development path, uphold the existing international system, favor cooperation over confrontation while shouldering more responsibilities, as the country moves closer to the world’s center stage. The press conference, held on the sidelines of the annual session of the National People’s Congress, is regarded as a once-a-year opportunity to take a thorough look at China’s foreign policy and understand its views of the world affairs. Wang said the fundamental guideline for China’s diplomatic work in the new era is Xi Jinping Thought on Diplomacy, which points the way for navigating through a complex array of issues in today’s world. “A key part of Xi Jinping Thought on Diplomacy is developing a new path of state-to-state relations featuring dialogue instead of confrontation, partnership instead of alliance,” said Ruan Zongze, EVP of the China Institute of International Studies. Under the spotlight are China-US relations, as some fear a looming Thucydides Trap, which warns of cataclysmic war between a rising power and an established one. Noting that competition is normal, Wang said exaggerating competition would reduce the space of cooperation. “China and the US stand to gain from cooperation and lose from confrontation,” the state councilor said. The interests of the two countries are indeed inseparable. Bilateral trade surpassed $630 billion last year, with cumulative bilateral investment reaching $240 billion. Wang noted the substantial progress made in the ongoing economic and trade consultations. “We still have a positive outlook on China-US relations. The two countries will not, and should not descend into confrontation,” he said. A good example of major-country interaction is demonstrated by China and Russia. As China and Russia mark the 70th anniversary of establishing diplomatic ties in 2019, leaders of the two countries are expected to exchange visits, the state councilor said. “When China and Russia stand together, the world will be a safer and more peaceful and stable place,” Wang said. Responding to a question on the recent tension between Pakistan and India, Wang reiterated China’s call for calm and restraint. Disagreement should be settled by goodwill, he said. Wang applauded the recent DPRK-US summit, describing it as an important step toward a political settlement of the Korean Peninsula nuclear issue. While acknowledging that it’s impossible to solve the issue overnight, Wang said the concerned parties should not be “a prisoner of history,” urging them to break the cycle of mistrust and together work out a general roadmap for achieving denuclearization and a peace mechanism on the peninsula. Wang took note of the stabilized and improving situation in the South China Sea, appealed to all parties in Afghanistan to “push open the door to peace,” and warned against “historical lessons” being repeated in Venezuela under external interference and sanctions. “Upholding peace and development is the ‘secret to success’ of China’s diplomacy and a great contribution China makes to the world,” Ruan said. Wang also made it clear that China will firmly protect its legitimate rights and interests. Wang said it was not a pure judicial case, but a “deliberate political move,” adding that China has taken and will continue to take all necessary measures to resolutely protect the legitimate interests of Chinese firms and citizens. A centerpiece of Xi Jinping Thought on Diplomacy is to build a community with a shared future for humanity, experts said. 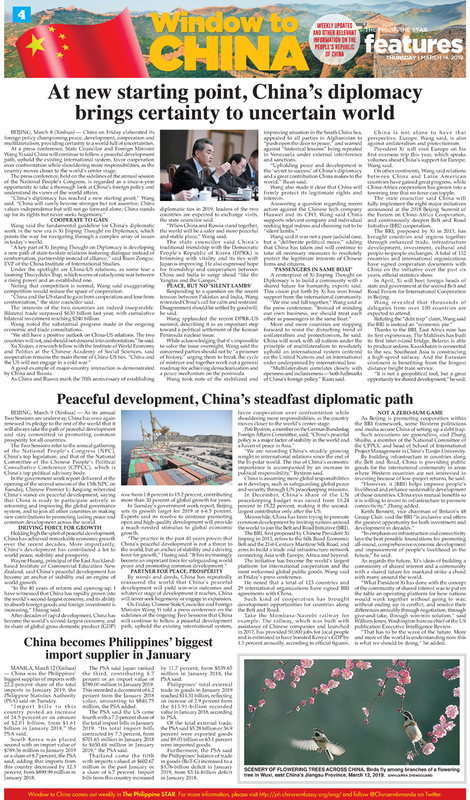 This vision put forth by Xi has won broad support from the international community. More and more countries are stepping forward to resist the disturbing trend of unilateralism and protectionism, he said. China will work with all nations under the principle of multilateralism to resolutely uphold an international system centered on the United Nations and an international order underpinned by international law. “Multilateralism correlates closely with openness and inclusiveness — both hallmarks of China’s foreign policy,” Ruan said. China is not alone to have that perspective. Europe, Wang said, is also against unilateralism and protectionism. President Xi will visit Europe on his first overseas trip this year, which speaks volumes about China’s support for Europe, Wang said. On other continents, Wang said relations between China and Latin American countries have gained great progress, while China-Africa cooperation has grown into a towering tree that no force can topple. The state councilor said China will fully implement the eight major initiatives announced at the 2018 Beijing Summit of the Forum on China-Africa Cooperation, and continuously deepen Belt and Road Initiative (BRI) cooperation. The BRI, proposed by Xi in 2013, has brought countries and regions together through enhanced trade, infrastructure development, investment, cultural and people-to-people exchanges. A total of 152 countries and international organizations have signed cooperation documents with China on the initiative over the past six years, official statistics show. In April, Xi will host foreign heads of state and government at the second Belt and Road Forum for International Cooperation in Beijing. Wang revealed that thousands of delegates from over 100 countries are expected to attend. Thanks to the BRI, East Africa now has its first expressway. The Maldives has built its first inter-island bridge. Belarus is able to produce sedans. Kazakhstan is connected to the sea. Southeast Asia is constructing a high-speed railway. And the Eurasian continent is benefiting from the longest distance freight train service. “It is not a geopolitical tool, but a great opportunity for shared development,” he said.